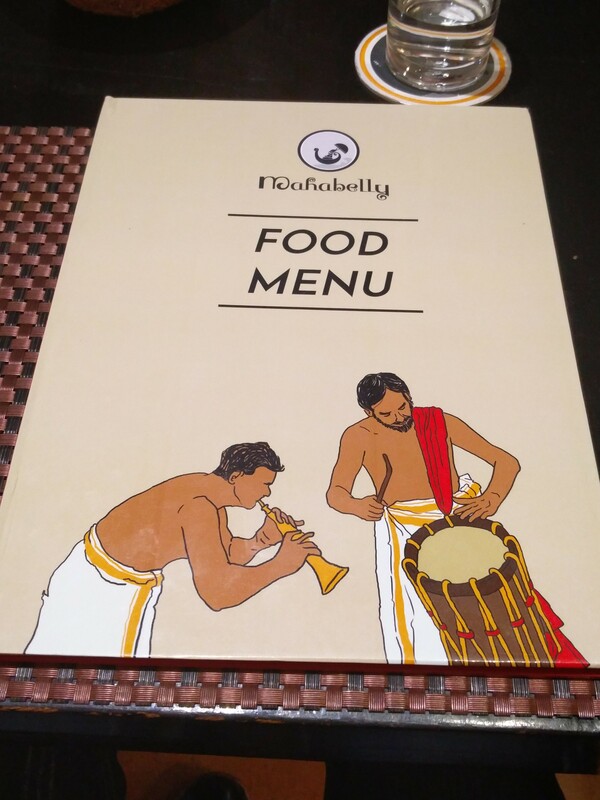 Mahabelly is a fine spacious (and reasonably priced) restaurant in Saket recently opened in March 2015 by two St. Stephen’s graduates, Zachariah Jacob (Lawyer) and Thomas Fenn (Management Consultant) who are from Kottayam in Kerala. 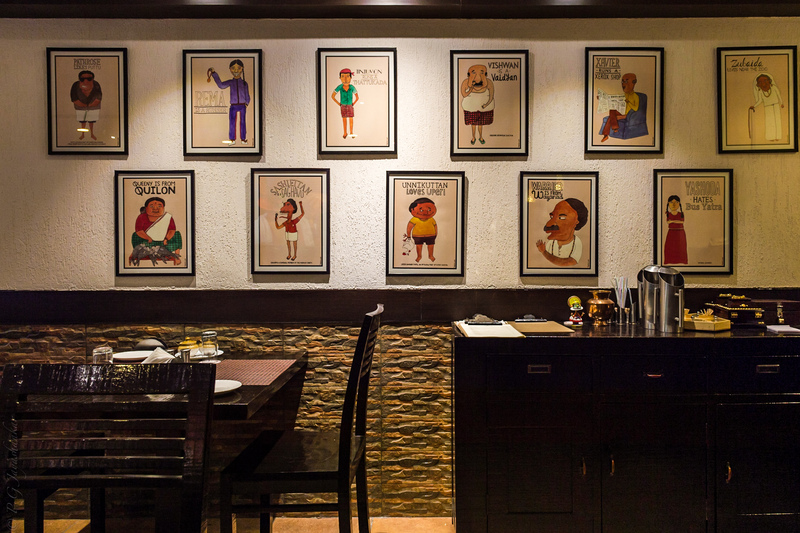 There are pictures & scriptures of their elderly grandmothers & forefathers in the restaurant along with a big poster of Kathak dancer with big expressive eyes, with a nice soothing music playing in the background. The seating is mostly on big dark wood comfortable wooden chairs. 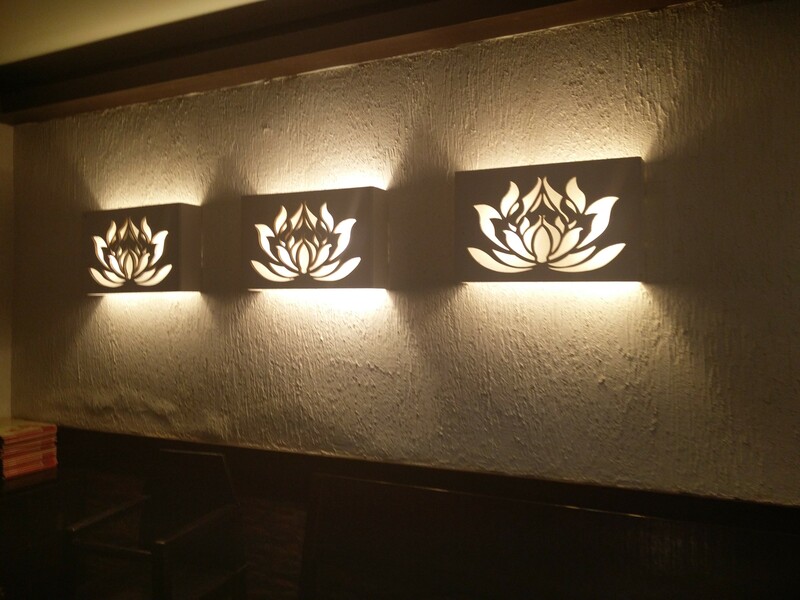 As I could not move my eyes from the Kathak dancer which looked so colourful, beautiful and different, never seen it anywhere before, I took a seat in front of it as it interspersed & inspired a passion in me, triggered me to try some wholesome Keralite food as the colourful amalgamation of comfort level that I felt with the soothing music and the lotus flower, lanterns on the walls, the unique set-up, the lovely caricatures and Jacob himself present to tell us about the restaurant, I could not wait but to try the food. 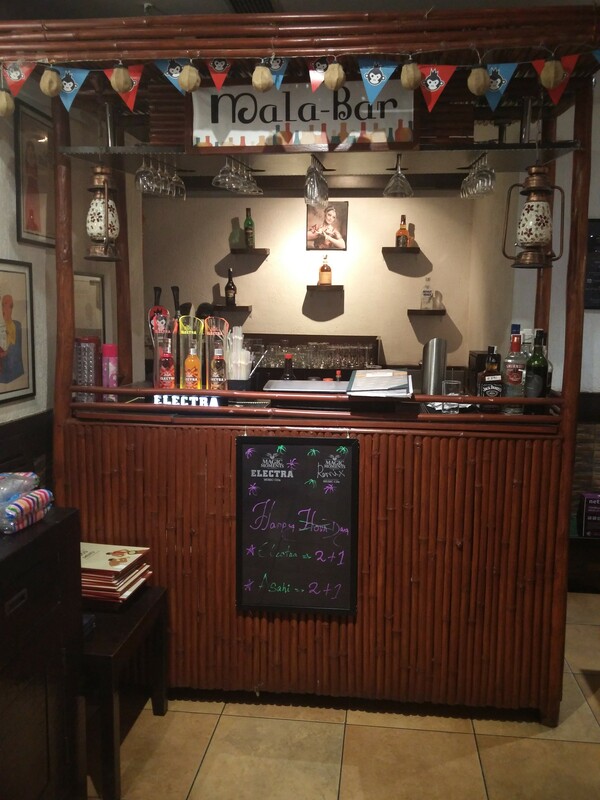 There’s more magic here, I could also see a Mala-Bar in one corner (an electrifying drink station) to add some fun & mischief to your food session. The cuisine is mostly Kerala cuisine with influences from Syrian Christian, traditional Nair and Malabar Moplah style of cooking. 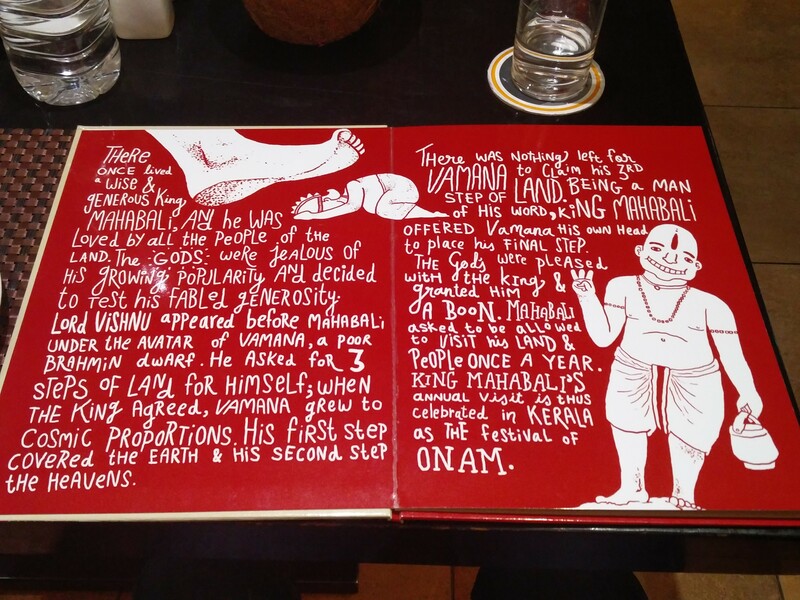 With the fresh aroma of curry leaves, coconut oil & sunflower oil and a taste of mango pickles kept on the table, I started my food journey at Mahabelly. First was Mini Vadas with chutney. 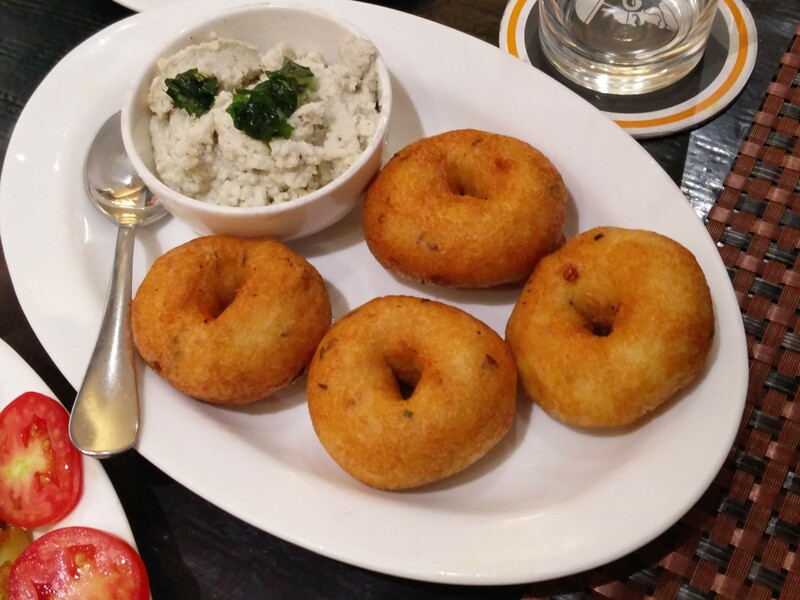 They were nice, soft & small vadas served with delicious sambhar, coconut and tomato chutney. 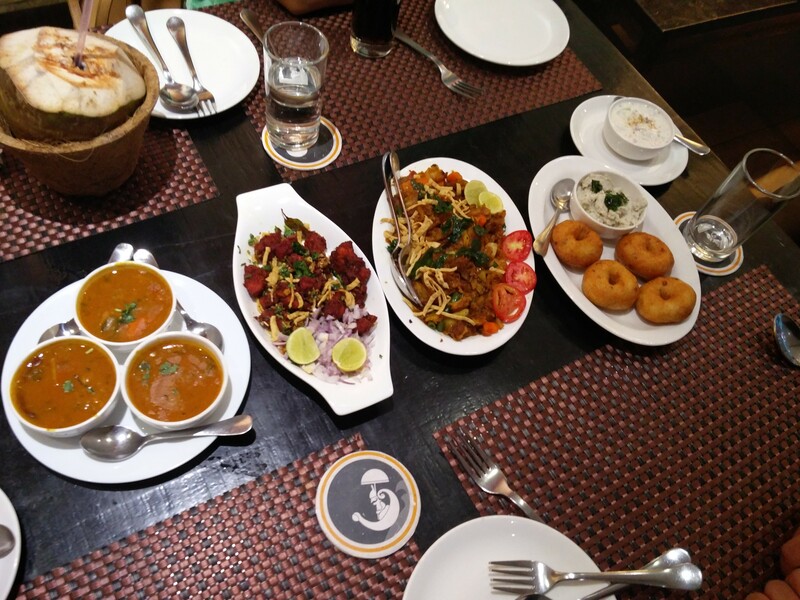 I loved eating it and so relished the extremely delightfully cooked soft vadas. 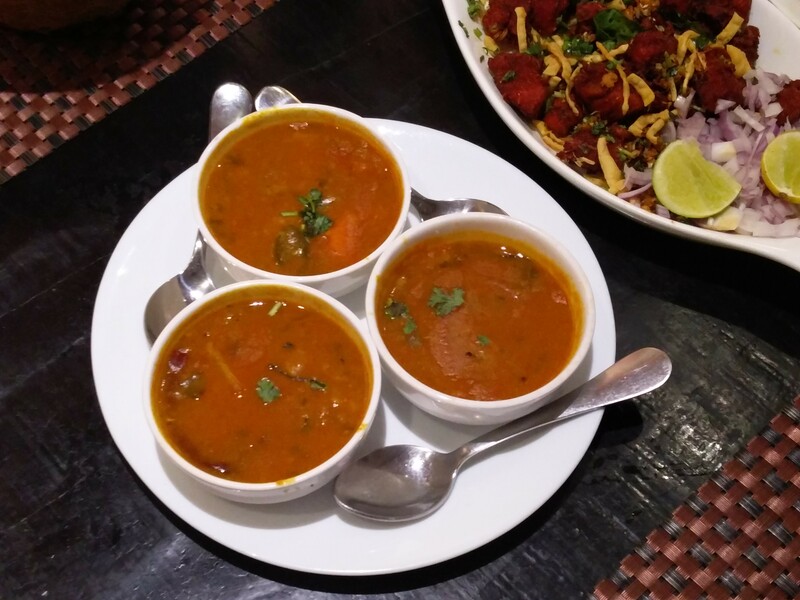 The Sambhar was well done and had the typical Kerala taste. It tasted great. The Coconut Chutney had lots of curry leaves in it, very nicely done with flavours of coconut, curd, coriander & roasted chana. I loved it as it had the perfect texture. 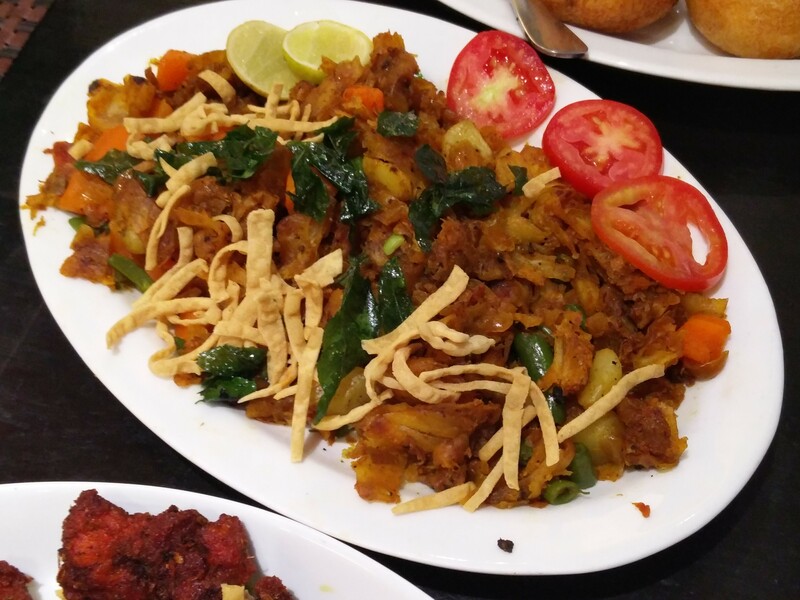 The Kothu Porotta (Shredded Malabar paratha with choice of vegetables/egg/chicken) had nice chunks of porotta melting in my mouth and tasted delicious. 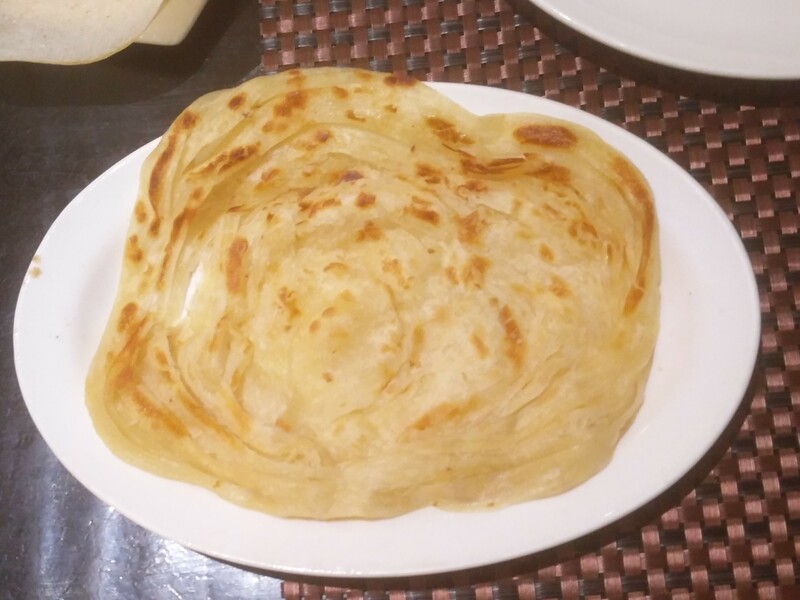 I tried the vegetarian version which had lots of carrots, potatoes, green chillies, onions, curry leaves & beans mixed in parottas served with tomatoes & lemon. It is indeed a must try here for I have never had such a tasty affair with my tastebuds. 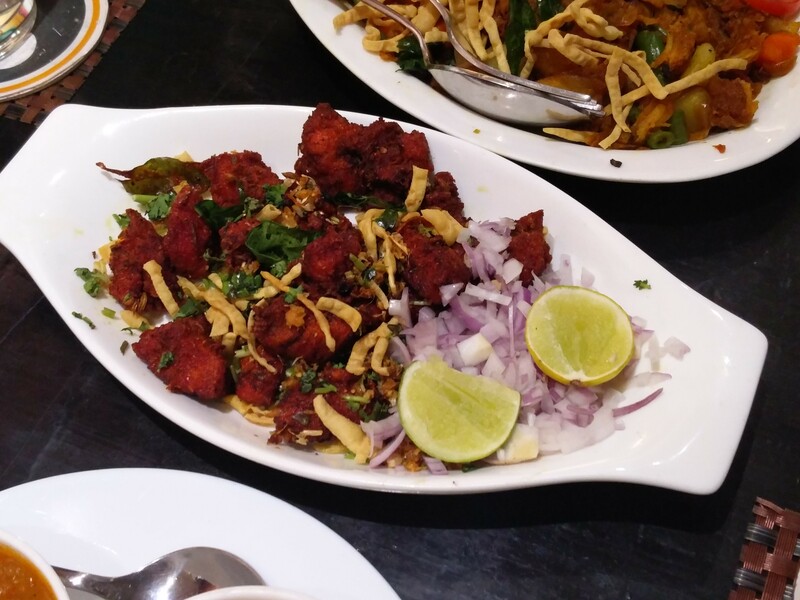 The Chicken 65 (spicy boneless deep fried South Indian chicken dish) was spicy and fried (a little oily) served with lemon & onions. It was good, well done and crispy as well. 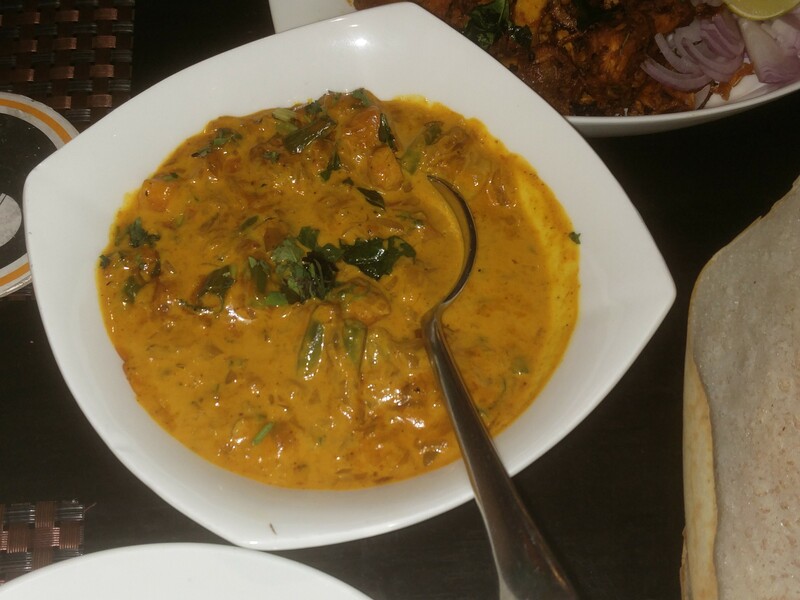 The Vegetable Kurma had mildly spiced vegetables simmered in delicate coconut milk. What I loved was the sweet aroma of coconut in it though could be a little strong for some people. 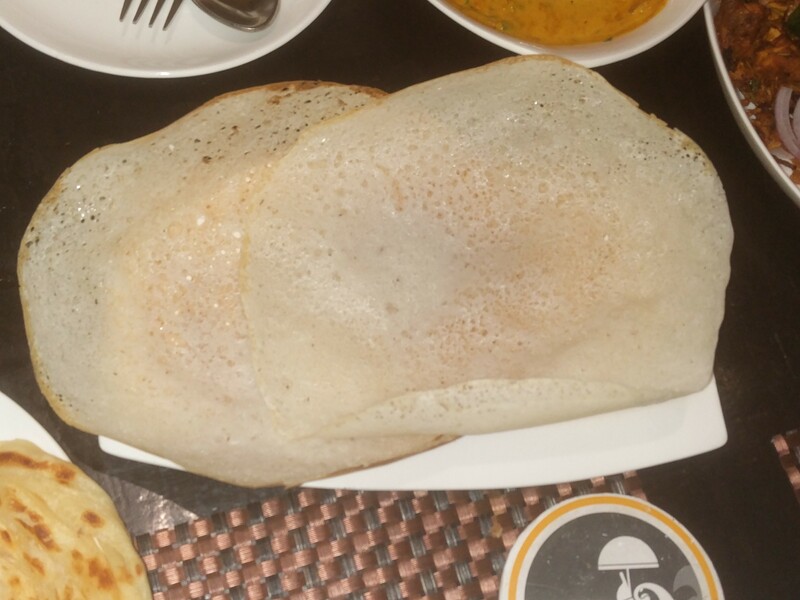 The Appams were soft & delectable but I would prefer the Malabar Porottas which were the best I have had. 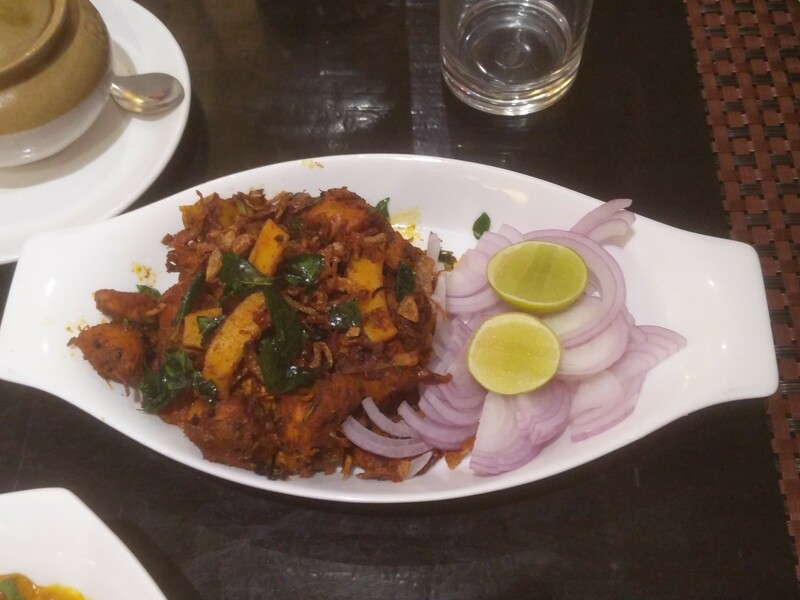 The Varattiyathu (boneless chicken sautéed with onions, herbs & spices) was tasty & well made with the right spices & true taste of Kerala. It was a delicious & healthy combination with a unique Kerala taste which was different & interesting in the recipe. Next was Biriyani (Mahabelly Mopala Biriyani served with raita, pickle & pappadam). I opted for a chicken biryani which had fresh, fleshy & juicy chicken pieces along with boiled egg. It was pretty strong on flavours with a blend of spices. 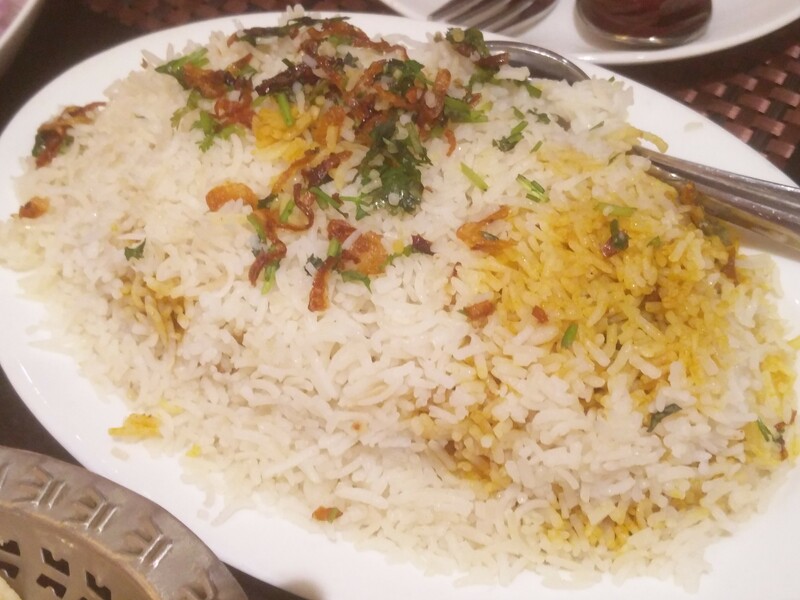 Now who doesn’t like a big plate of hot delicious delectable biryani served with the aroma of spices & chicken. 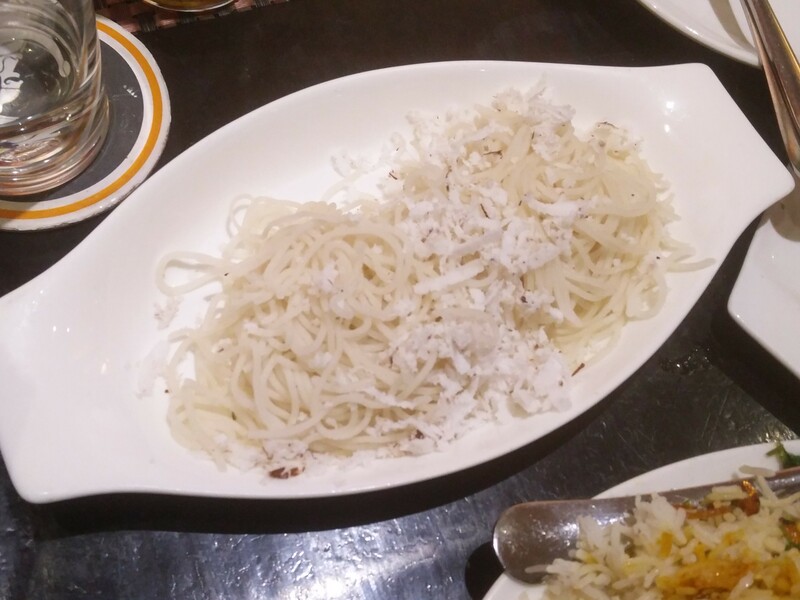 The Idiyappam had soft rice noodles which smelt & tasted wonderful with desiccated coconut shavings on top. 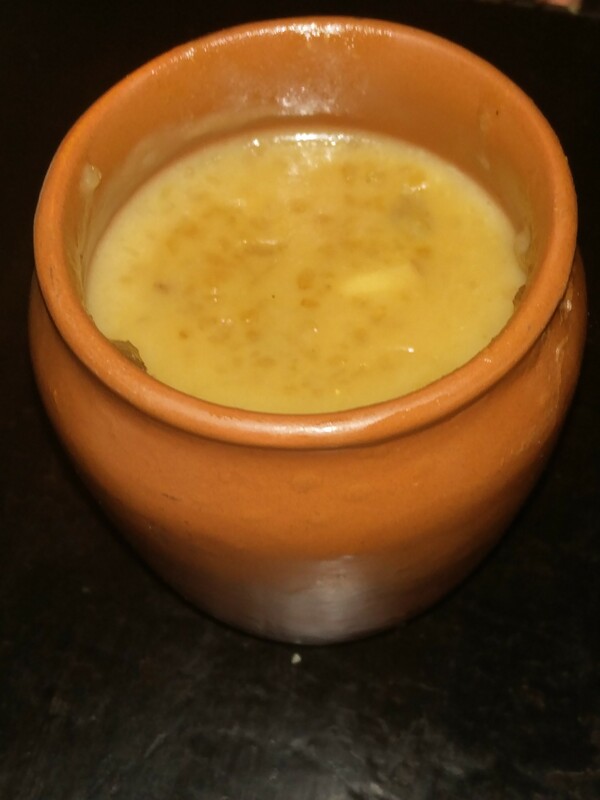 Coming to the desserts, we tried the Payassam of the day which was a sublime combination of milk & sugar. It was a little too sweet for me and I’d recommend to those who like too much sweetness. I’m not too fond of it so it wasn’t for me. The Caramalised Banana with ice-cream & palm treacle was nice & different. 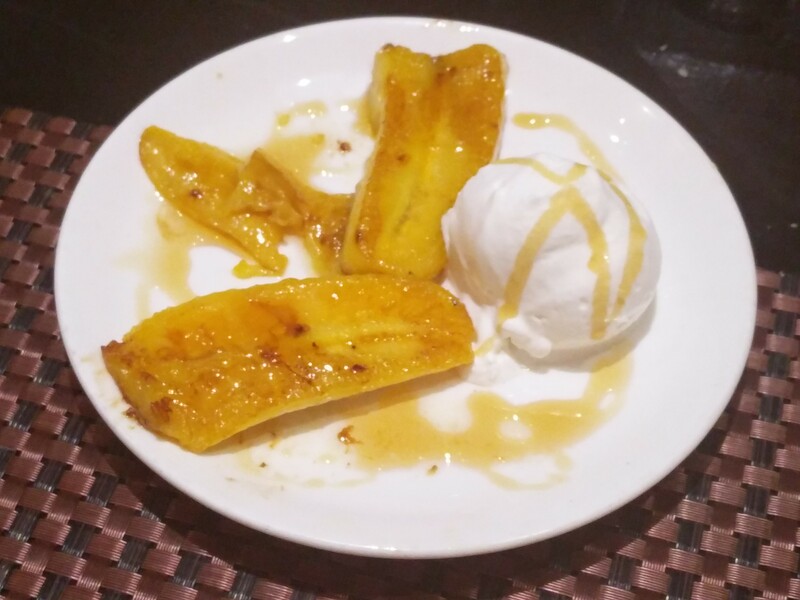 It had pealed caramelized fresh bananas which melted down my throat with the ice-cream. Loved it! So what I ate here was different from my regular routine, all the new recipes which I never tried, I tried them for the first time and it made me happy. They have a total of 5 chefs in the team and they even do home delivery upto 6 kms. 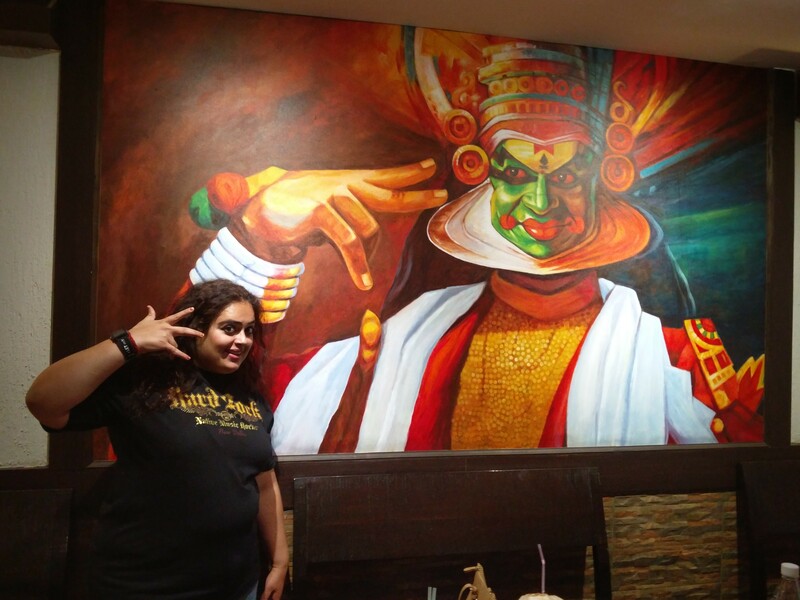 So people fond of Keralite delicacies should come & try the amazing food here for the ambience which you will not forget, the music so soul stirring and a great getaway on weekends for sure, you can relax, chill and have the lovely food here. Hoping to see more Mahabellies in the future, hope it grows & prospers in number and people who love food will definitely love what Mahabelly has to offer.